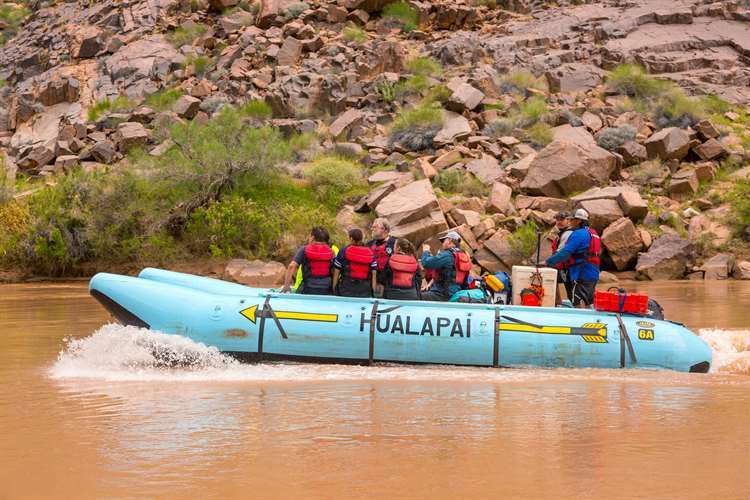 Ride the Colorado River’s rapids with the experienced guides of Hualapai River Runners. 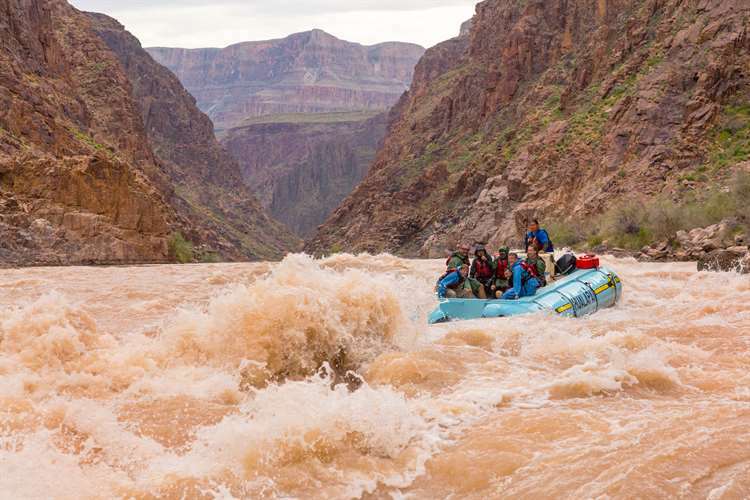 Whitewater rafting is a thrilling way to experience a new perspective of the Grand Canyon—from the Colorado River in-between the rugged canyon walls. 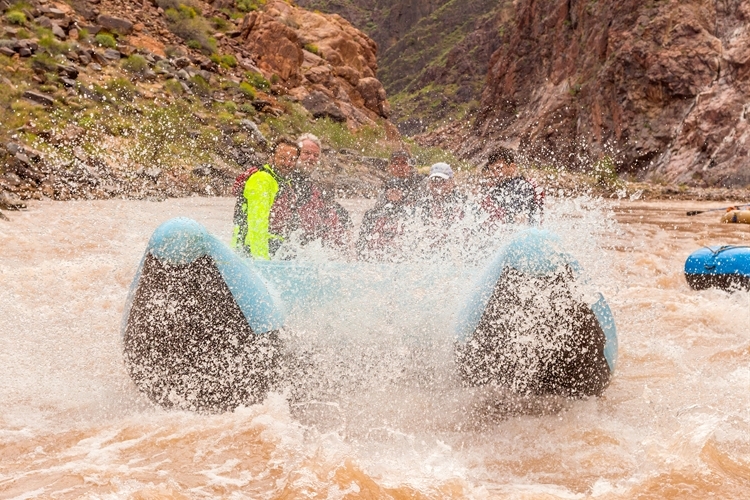 Choose from one- or two-day rafting trips, which include a ride along exciting rapids, hiking at Travertine Cavern Falls, local wildlife viewing, lunch along the banks of the river, and an exciting helicopter ride from the river up to Grand Canyon West. 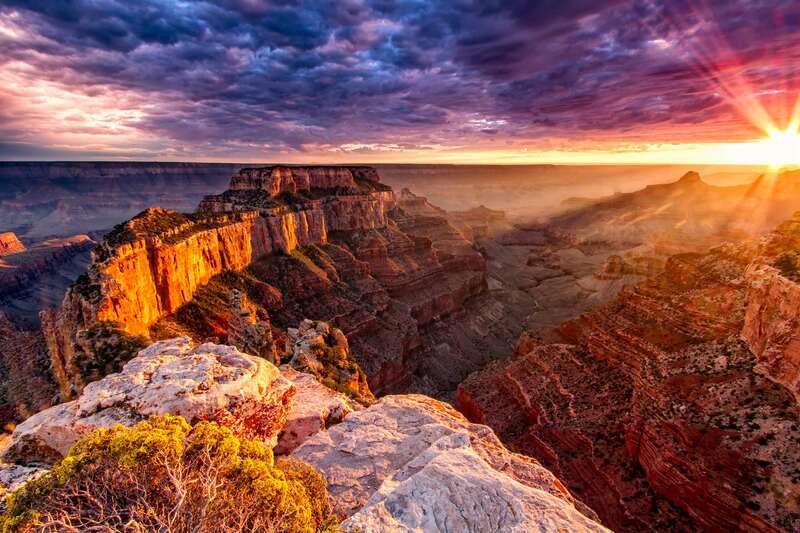 When visiting please keep in mind that Grand Canyon West does NOT participate in Daylight Savings Time. Be sure to leave early enough to arrive on time for any scheduled tours. Have questions? We have answers. Visit Frequently Asked Questions page for information. To book your excursion, please call 1-888-868-9378 or 928-769-2636. Your one-day rafting adventure starts at our Peach Springs staging location at 8 a.m. From there, you’ll hop on a bus to the Colorado River and enjoy beautiful scenery along the way. Then, you’ll climb into your raft and begin your journey over 12 miles of whitewater rapids (safe for beginners, but sure to guarantee a thrill). Next comes Travertine Cavern Falls, where you’ll enjoy a moderate hike to the cavern and natural waterfall, followed by lunch along the riverbank. After lunch, you’ll enjoy a smooth water ride through the Canyon. 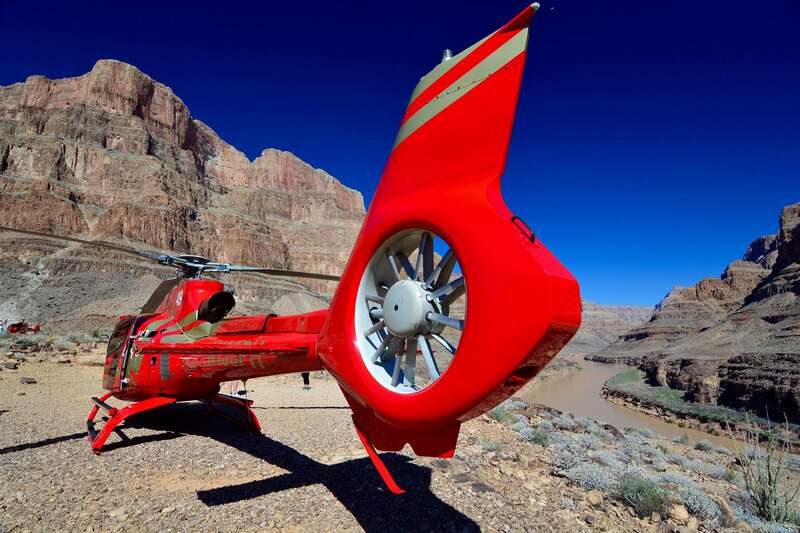 When you take the helicopter flight from the river to the rim of Grand Canyon West you can participate in the Add On tour of the Skywalk and Eagle Point. Ground transportation will return you to Peach Springs in time for dinner. Children must be ages 8 or older to participate in our one-day rafting tour. Includes 4 One-Day Whitewater Rafting and Helicopter Lift tickets and one night at the Hualapai Lodge in Peach Springs, AZ. Enjoy a weekend of fun with our Two-Day Whitewater Rafting adventure! 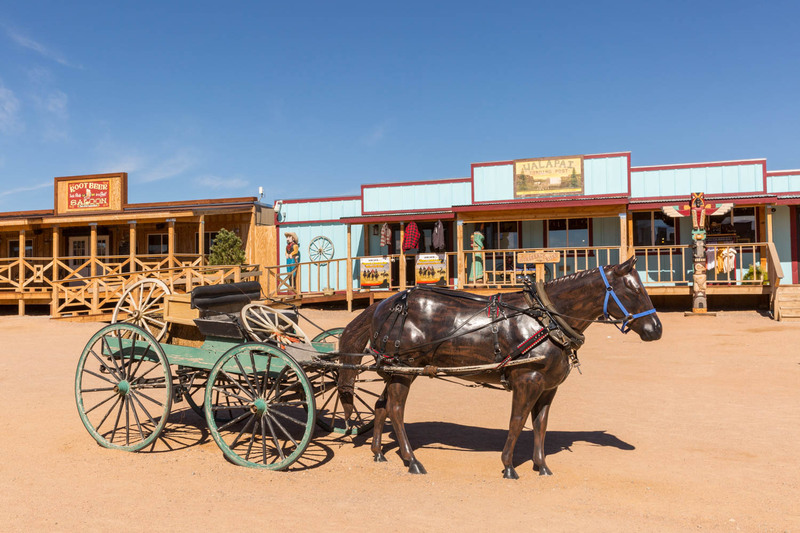 Stay Friday night at Hualapai Lodge along historic Route 66 in Peach Springs. Then, come Saturday at 7 a.m., this weekend-only excursion kicks into gear. During your first day on the mighty Colorado, you’ll shoot miles of whitewater rapids and hike and take pictures at Travertine Cavern Falls. You’ll paddle raft down river to Spencer Canyon, where you’ll camp for the night and enjoy a steak dinner amid nature. On day two, you’ll board power pontoon boats and float along for nearly 30 miles of some of Mother Nature’s most thrilling scenery. Your experienced guide will narrate the adventure and share true stories of the history and culture of “the People of the tall Pines.” Your trip includes lunch and dinner on Saturday, breakfast and lunch on Sunday, plus assorted snacks and drinks along the way. 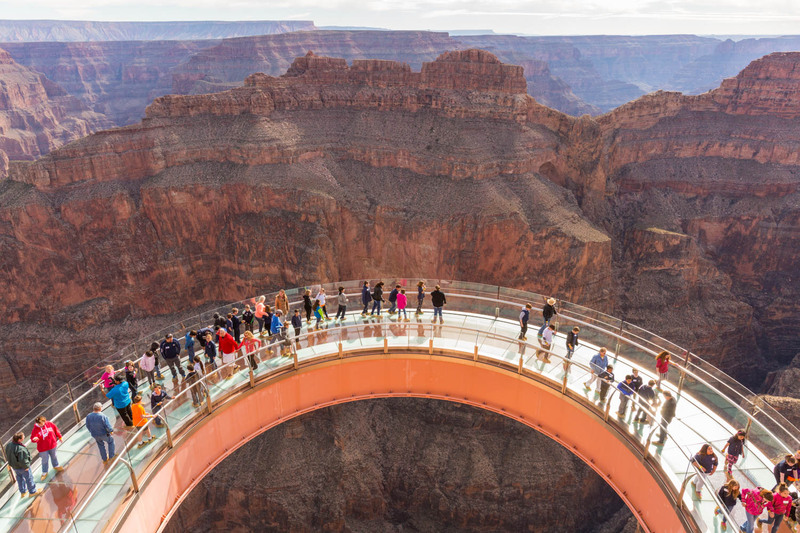 When you take the Helicopter Ride to the rim and Grand Canyon West you can add on the tour of the Skywalk and Eagle Point. Transportation back to the Hualapai Lodge is provided. Children must be ages 12 or older to participate in our two-day rafting tour. 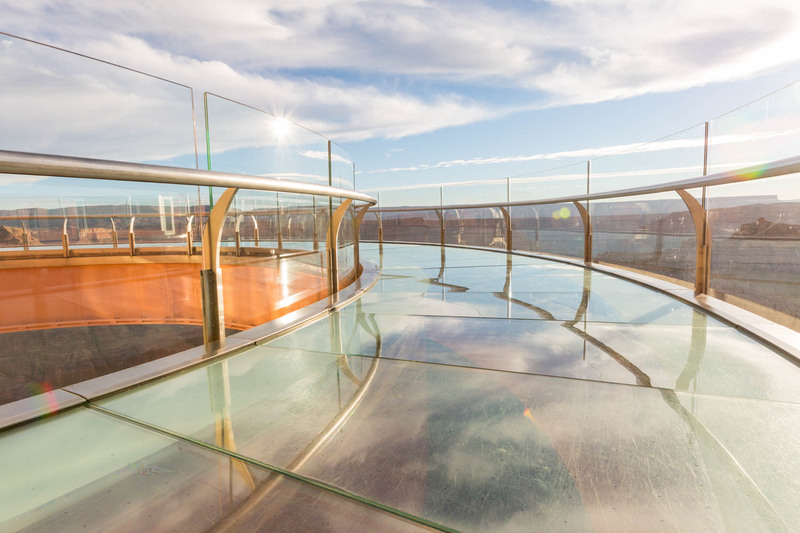 The Water Walk add-on gives you access to Eagle Point and the Skywalk when fly up to the rim. 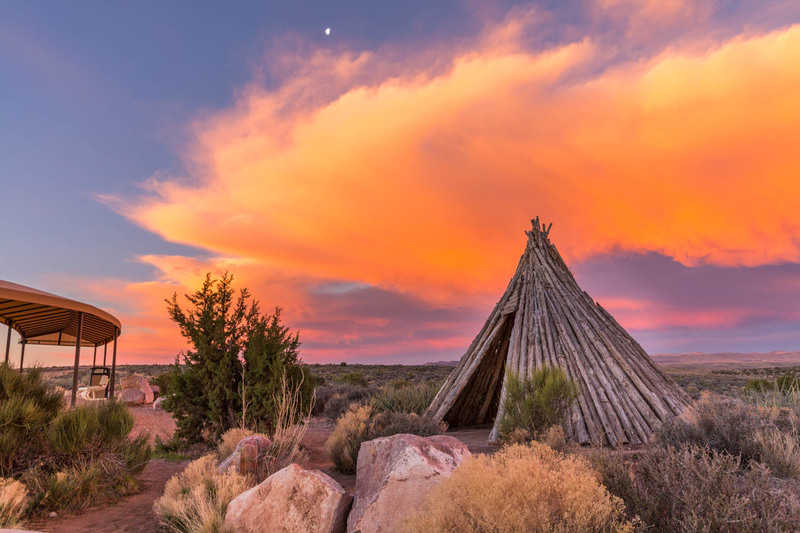 This Package includes four (4) Two Day Paddle Rafters, four (4) Helicopter Lift tickets, four (4) Water Walk tickets, Meals for four (4), and one room for one night at the Hualapai Lodge. 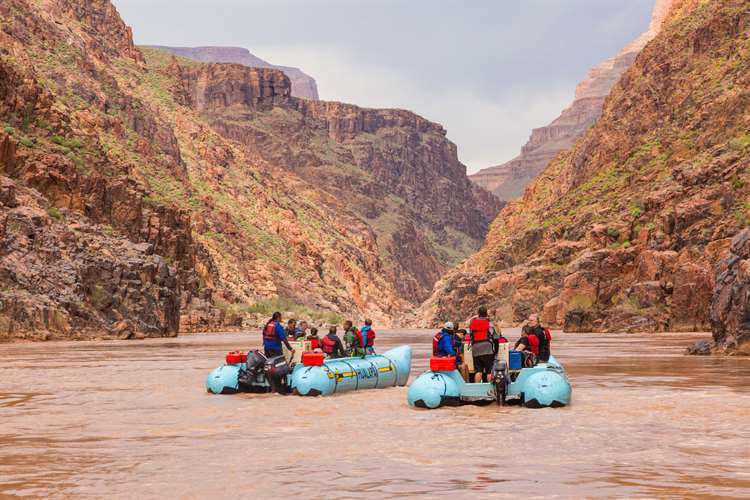 The Colorado River carves a distinct course through the geologic history of the Grand Canyon, telling the story of the Earth’s formation and structure like few other places. Over the past 6 million years, the river has carved through the layers of limestone, sandstone, shale, granite, and schist that make up the canyon’s rock sequences. These layers continue to be worn away through water and wind erosion, creating new cliffs and slopes with the passing of time. 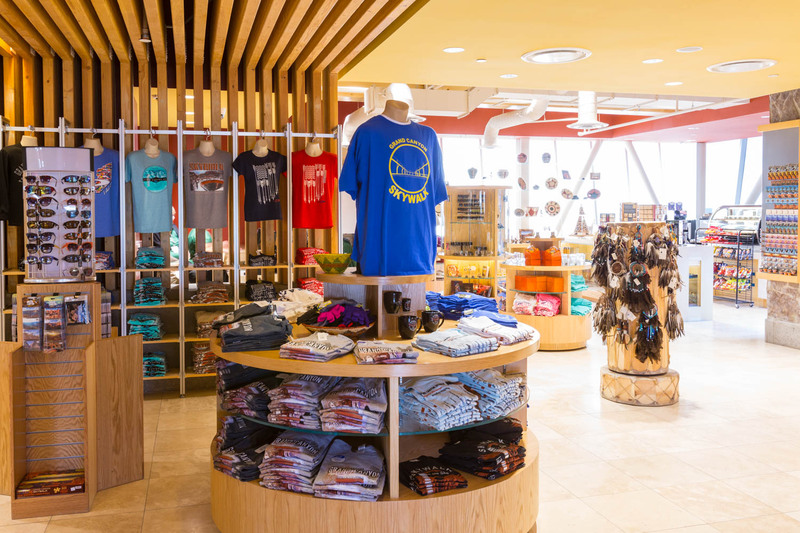 In addition to carving its way through the canyon, the Colorado River has been an important source of water and life for Native Americans communities living in and around Grand Canyon National Park. 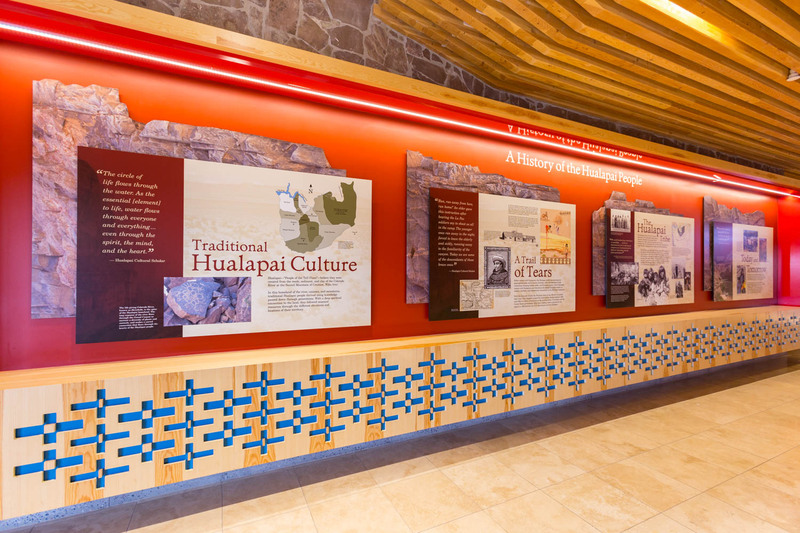 Indigenous groups like the Havasupai, Hopi, Hualapai, Paiute, Navajo, Yavapai-Apache, and Zuni Tribes use the river’s water for agriculture and to fortify their lives in the canyon and along the rim. These tribes are active in decisions regarding uses of the river. Whitewater Tours - You will get wet. Dress in quick drying clothing and remember to bring Sun Block. If you wear a hat make sure it is snug on your head and/or has a drawstring to keep it from being knocked off by the spray of the water. A dry bag is provided if you choose to bring a change of clothing with you. A water tight ammo box is also provided if you need to secure your cell phone or other small items you do not want to get wet. Bottled water, lunch and snacks will be provided on the trip so do not bring any food or beverages with you. Hang on and have FUN!